A mind map which shows some of the performance specifications required within an enclosure which would enable rugged outdoor use. An image of my printrobt. This image was taken while it was working but new modifications have now been made. The coupling and wiring has now been replaced. Here is a quick picture of the printrbot that I am currently building. The printed parts come from Karl Moko’s uprinter, and have a couple of different colours which are made through a layering technique. The layering allows for some more aesthetic exploration in terms of colours, and can make interesting effects on curved surfaces where colour almost raps around the curve (similar to wood grain, or plyy wood, when curves are cut into them). The effect is really cool, however if the filament being used does not melt at the same temperature there can be bonding issues during colour transition (often colour is a good indicator of how well something will blend, with darker colours needing higher temperatures). A quick fix for this is using a soldering iron to reheat the surfaces and “glue” the pieces together. The build is coming along quite well, with some modification having to be made to some of the printed parts, aswell as playing around with techniques to getting lowering tolerances with all parts, trying to remove any wiggle and add more stability. The extruder heads we received were meant for makerbots, not the printrbot. So the extruder heads will still do what we need, just a bit to big for the parts we currently have. So a laser cut modification should fix this issue. The below video is from the first build day – it was made by Jethro Pugh using his Sony DSLR with a fish eye and an arduino based time lapse. Most of us are in Youssef Tayeb’s class, Industry of One, at RMIT. By the end of this project we should have 8 working Printrbots. One has been completed, 7 more to go! Instead of mechanical pressure, gravity is being used to force filament out. A cartidge heate is also being used rather than wire elements which are rapped around the chamber. Global Village Construction Set – TED Talk from Open Source Ecology on Vimeo. Some images from the RMIT Advanced Manufacturing Labs. Interesting concept for a online print shop where you can upload files and have the physical version sent you doorstep. You can host your files on their site and get royalties for the pieces which people print out. The most interesting part of this site is the custom printing section, which allows anybody that knows how to use a mouse and upload a picture to create their very own personalised 3d prints. its almost too easy, i just wonder what the logevity of these products will be, and can you pass them onto somebody else when your done? Very cool concept either way and I believe this type of customisable printing will only become bigger. We can now print in foods and concrete due to a syringe like extrusion head for the Makerbot. 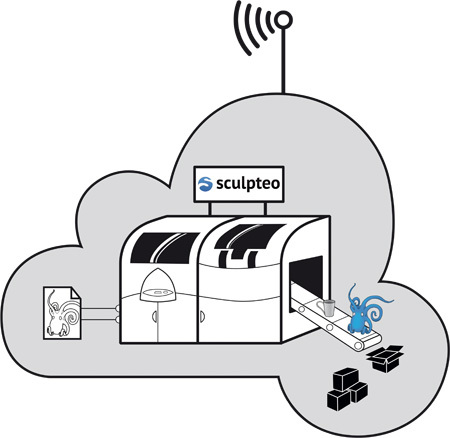 Blue[dot]org is currently getting his filament custom extruded by Advanced Extrusions, so there is a need for extrusion within the house if people are having to outsource, a process which could be time consuming and costly. Extruded filament can be used not only for the 3d printer, but also to make weaved fabrics or as web4deb was doing, making garden accessories. Die deutschen haben es glaubich gescahft! Aber mit was, nur granule. Also jetzt muss mann es auch koennen ohne granule, und halt mit muell.